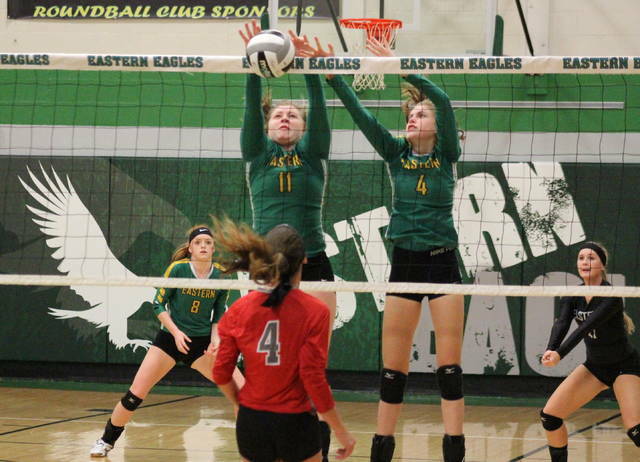 Eastern senior Morgan Baer (15) spikes the ball in front of classmates Sidney Cook (13) and Mackenzie Brooks (right), during the Lady Eagles’ sectional final victory on Thursday in Tuppers Plains, Ohio. TUPPERS PLAINS, Ohio — The Lady Eagles were on a mission and now they’re headed back to district tournament. 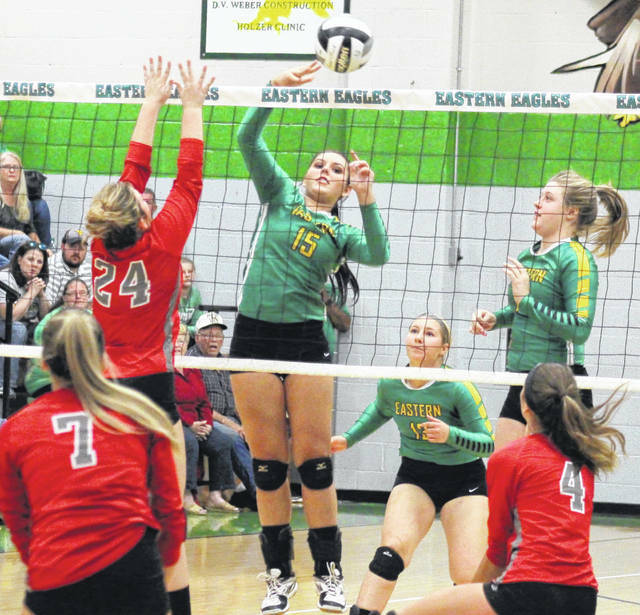 The third-seeded Eastern volleyball team never trailed in a straight games win over visiting Symmes Valley on Thursday night in Meigs County, giving the Lady Eagles their third consecutive Division IV sectional title. After Eastern (16-7) scored the first five points of the night, Symmes Valley battled back to tie the game at six, but it was the only tie of the match. 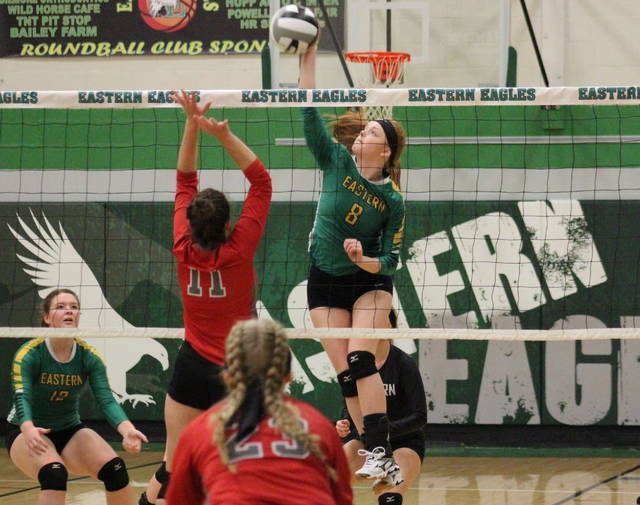 The Lady Eagles recorded two aces and nine kills in the opener, taking the game by a 25-16 final margin. Eastern recorded 20 service points in the second game alone, rolling to their largest victory of the night at 25-9. The Lady Eagles boasted a match-best side-out percentage of 72.7 in the third game, capping off the sweep with a 25-10 win. For the match, Eastern finished with a side-out percentage of 64.9, while the Lady Vikings ended with a side-out percentage of 27.0. As a team, the Lady Eagles finished with 58 digs, while committing two service errors and four attacking errors. EHS senior Morgan Baer led the way for the victors, earning 15 service points, including three aces. Elayna Bissell posted 13 points and one ace in the win, Jenna Chadwell chipped in with 11 points and an ace, while Allison Barber recorded eight points and one ace. Morgain Little and Mackenzie Brooks rounded out the EHS service attack with five points and one point respectively. Barber paced the Lady Eagles at the net with 10 kills and one solo block, followed by Brooks with nine kills and seven blocks. Chadwell marked four kills and three blocks, while Kelsey Casto and Morgain Little each had three kills, with Casto also earning a block. Baer earned two kills, four blocks and a match best 29 assists in the victory. Barber also led EHS on defense with 17 digs. Savannah Webb led the Lady Vikings with eight service points, followed by Kinley Patterson, Ericca Ross and Hannah Gates with two apiece. Kaitlyn Crabtree recorded one point for the guests, rounding out the category. The Lady Eagles have now 21 sectional titles in the last 22 seasons. 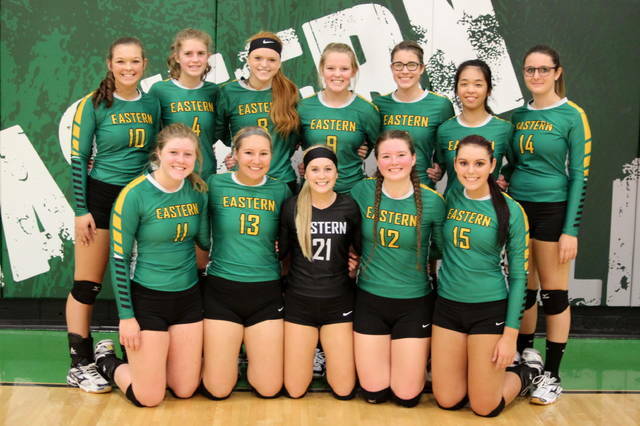 Eastern will have a shot at revenge when it travels to Jackson High School for the Division IV district semifinal at 7 p.m. on Wednesday, as the Lady Eagles will meet with Portsmouth Clay, which eliminated EHS in the opening round of the 2016 district tournament.